Water pumps are everywhere in agriculture, essential both for irrigation and for heating, ventilation and cooling (HVAC). In the intensive sectors, frequency converters can halve energy consumption in some applications, with savings rapidly covering the costs of the technology. Energy savings can vary significantly depending on the characteristics of the system and the type of operation. Typical savings range from 30 to 50 percent. Water pumps that experience highly variable demand conditions are often good candidates for frequency converters. In such cases, electronic controls vary the frequency and voltage supplied to the motor, which regulates the motor speed and, in turn, adjusts the pump's output. Not all water pumps and applications will benefit from having frequency converters, however. Frequency converters are not recommended for systems with high static head or pumps that operate for extended periods under low-flow conditions. A further consideration is the operating environment of the water pump and the relative sensitivity of frequency converters and their digital control systems to environmental conditions. For example, it may be unwise to install expensive frequency converters in locations with a high likelihood of lightning strike. In principle, frequency converters can be installed on any water pump; however, this is not always practical or cost-effective. The frequency converter needs to be connected to a control signal and may also require the installation of measurement devices or controllers, which typically should be included in the costing of the measure. The financial viability of installing a frequency converter depends on the motor application and operating hours. Frequency converters tend to be most economical when fitted to large pumps. Frequency converter budget prices are typically $100 to $300/kW for low-voltage units of less than 100 kW, and can be 30 to 80 percent higher for high-voltage ones. Frequency converters can be retrofitted on existing motors but limitations related to the recommended minimum speed (e.g. overheating) must be checked. Harmonics can also reduce the motor's efficiency, so it is recommended that you check whether harmonic filters are required to protect your motor. As opposed to common flow-control methods such as throttling valves or bypass systems, the principal advantage of frequency converter technology is that it better matches the fluid energy the system requires with the energy the water pump delivers to the system. The water pump's power is proportional to the cube of the motor's speed; therefore a significant reduction in power (and energy savings) can be achieved by reducing the speed of the motor. A frequency converter can alleviate the need to throttle the flow (and lose energy), or allow the water or refrigeration fluid to be pumped more slowly, reducing frictional energy loss. Soft start and stop capabilities also reduce mechanical and electrical stress as well as the risk of water hammer. Right figure shows that as the motor's speed is reduced, the pump curve moves downwards to the left and flow and head are reduced, resulting in lower power consumption. If a frequency converter was not used in this flow-control application, the flow would need to be reduced by throttling, bypassing or switching the water pump on and off. These laws apply only to systems with no or very low static head. 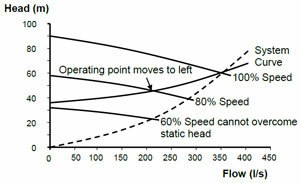 With significant static-head contribution, operating points move to the left. At slower speeds, the pump doesn't produce enough head to overcome static head and 'hydraulic shut-off' occurs. N1 and N2 are the original and new fan speeds respectively, and P1 and P2 are the original and new power consumptions. Estimate the energy savings if a frequency converter is retrofitted to a water pump to control flow as per process requirements. Reducing the flow rate would decrease pump efficiency. It is assumed that the efficiency of the water pumps at 75 percent flow would be 77 percent and the efficiency at 50 percent flow would be 70 percent. 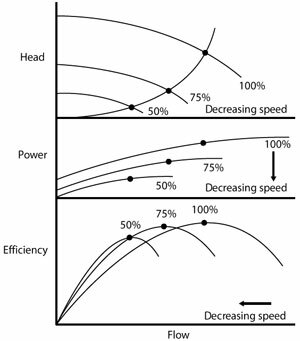 Motor efficiency does not decrease significantly until the motor loading drops below 50 percent; thus it is assumed the motor remains 92 percent efficient. The annual electricity usage is calculated below. Frequency converters result in losses in the form of heat; normally, their efficiency ranges between 95 and 99 percent. When comparing different devices, check their rated frequency converter efficiency. Frequency converters also cause harmonics that can reduce the efficiency of the motor. Though losses are typically low (approximately one percent), it's recommended that you assess the associated harmonics to check whether harmonic filters will be required to protect your motor. Frequency converter budget prices are typically $100 to $200/kW for low-voltage units and can be 30 to 80 percent higher for high-voltage ones. Installation costs will vary depending on the distance between the motor and the switch room (cable length) and whether an enclosure is required to meet frequency converter protection and refrigeration requirements.